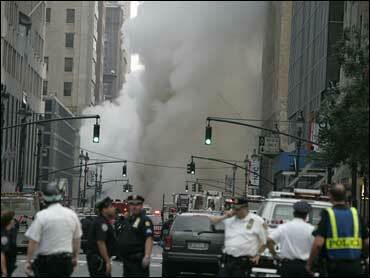 A woman whose sister died in the Sept. 11 attacks filed a lawsuit over last week's steam pipe eruption in Manhattan, saying Tuesday that the explosion brought back horrible memories. Francine Dorf's lawsuit accuses Consolidated Edison of negligence, saying the utility didn't properly maintain the pipe that ruptured outside her office and sent a geyser of steam, mud and asbestos-tainted debris over the neighborhood near Grand Central Terminal. "I thought a building was going to collapse," said Dorf, 52, a legal secretary. She is seeking unspecified damages. Dorf's attorney, Kenneth Mollins, said Dorf suffers from post-traumatic stress disorder and "a legacy of fear" from the 2001 attacks. He said the lawsuit is intended to force Con Ed to improve maintenance of its infrastructure. Her sister, Maria La Vache, was an employee of insurer Marsh & McLennan and was on the 99th floor of the north tower of the World Trade Center when it collapsed. Her body was never recovered. Dorf said she called her brother and mother after the steam pipe rupture last Wednesday to say goodbye. "I can't sleep, I can't eat. If I lay down I can see the smoke," she said. "And I think of my sister over and over again. What she must have went through on 9/11." A Con Ed spokesman said the utility does not comment on pending litigation.